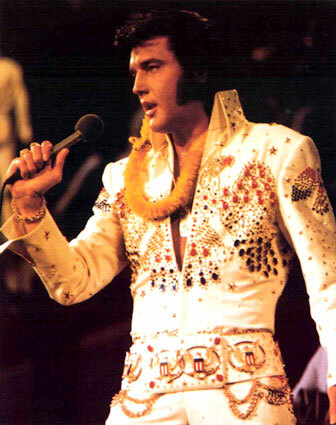 : The Elvis Presley weekend on channel 18! : How he lived! He looked and seemed to be makeing be laugh all the time. I would fall off his chair and people would laugh! Just was good to see! then i went on google and find out more and elvis all the info i found and printed out just made me fall more in love with elvis!!!! "My Message to Elvis": What are some tips u think you could give me on making myself big like yourself...seeing that i love music and acting just as bad as you do? : Don't you step on my blue suede shoes? -The drums are one of my favorite instruments so when i here that i play along with elvis an keep his tempo and beat and sing along all at the same time!!!! : It's has a cool tune to it! : Well i wasn't alive yet! But in shcool we were singing one of his songs and that's when i fell in love with elvis and the song was "don't you step on my blue suede shoes"!!!! : Because his music,actions,videos are still an were an inspiration to people!!! Like me i am a new fan of him! I mean i've alway's liked his music. But then at this year i saw the elvis prelsey weekend on tv and on the internet that's what drew ne closer. Was the internet and the tv. Thank you for taking part in our survey. Elvis liked to enter a light sense of humor in his live performances, interviews and live TV, even if at times it was just a facial expression. It made him more human, offering more to his fans and all involved in his world. Elvis was one of the kind!!! He is the King of Rock and Roll and still very much loved today.